So far this year, 14.5 inches have rained down in the Guerneville area. The street in Sonoma County's Guerneville is aptly named: River Road. Because this week, cars were not driving down it. Rather, the residents in this tiny wine country town were canoeing and kayaking along this waterlogged stretch of road thanks to the heavy rains and flooding Russian River. Lorin Deoleman, 62, who lives at 15861 River Road, even got the chance to kayak in her living room this week. She and her wife own the two-story home, where her mother lives upstairs. The Russian River creeped inside, swallowing up two beds, covering furniture and mud and causing the refrigerator to float about in the kitchen, she said in a phone interview on Thursday. But that didn't upset her at all. "You know, that'd be perfect for kayaking," she recalled saying to her sister and friend. And she she paddled off to find a cupboard holding her most expensive brandy. "It's Mother Nature," Deoleman said with a laugh. "Mom is safe and there's nothing you can do but just wait for the river to go down." 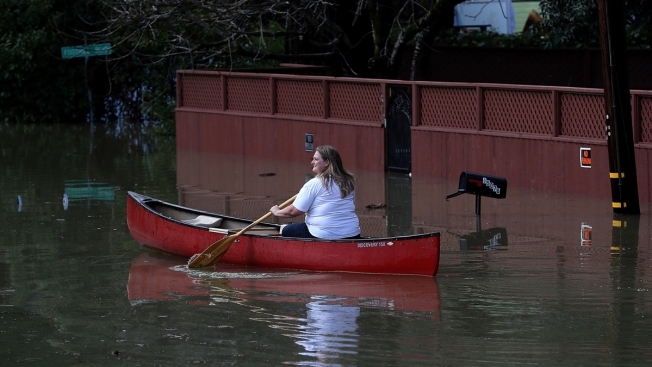 She may have been the only Guerneville resident boating about in her house. But earlier this week, a family was spotted canoeing on Neely Road, a teen was chatting happily on her cell phone and Dad was paddling by. Others took to boats and were seen rowing by the flooded out Pee Wee Golf and Arcade, where water from the flooded Russian River was six feet high. Dustin Coupe was bopping around town on an inflatable kayak after his basement was flooded out. Soon afterward, Jack Bagnoli cruised by in a row boat. "We're just making the most of it," Bagnoli said cheerily. "Those of us who have boats help each other out. I just helped one gentleman get to his car. We just cope." The river is at its highest level in about a decade. Late Wednesday it stood more than 37 feet, 5 feet above flooding levels. On Friday, however, meteorologists said the river levels should drop dramatically. By the end of the weekend, the river could drop back down to 15 feet. So far this year, 14.5 inches have rained down in the area from Jan. 1 to Thursday morning, that's three more inches since Tuesday, according to National Weather Service meteorologist Steve Anderson. But that still is way less than 1995, when the region hit a rainfall record: 18.41 inches fell during the same time period.